In a comment to the previous posting, Venelina Dimitrova raised a number of interesting issues, which I thought it would be best to address in a separate posting rather than in the comment section. 1. Is there a correlation between the SOV word order and a synthetic mode of expression? While I don’t know of any studies on this issue, we can easily examine figures in the World Atlas of Linguistic Structures Online, which allows us not only to see each feature or “linguistic structure” in isolation but also to combine two features and thus look for correlations. Let’s combine the feature #81A “The order of Subject, Object and Verb” with feature #20A “Fusion of Selected Inflectional Formatives”. 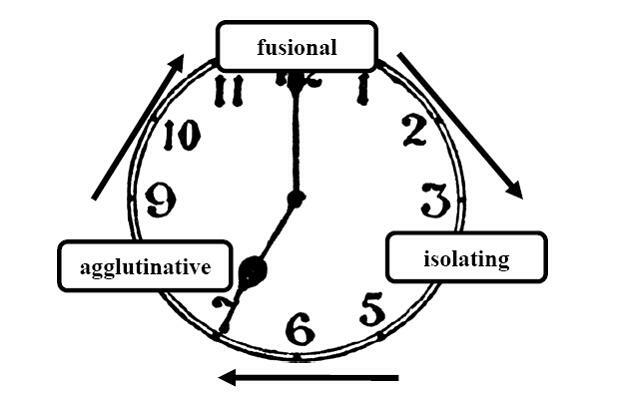 The feature #20A “Fusion of Selected Inflectional Formatives” refers to the degree to which grammatical markers (aka formatives) are phonologically connected to a host word or stem; there are three basic values: isolating, concatenative, and nonlinear (the latter includes tonal and ablaut). While some languages use exclusively isolating (Vietnamese), concatenative (English) or nonlinear ways of connecting grammatical markers (the latter is extremely rare), other languages use a combination of morphological types: tonal and isolating (Yoruba), tonal and concatenative (Maasai), ablaut and concatenative (Hebrew), isolating and concatenative (Mandarin Chinese). Do these morphological fusion types correlate with the order of major sentential constituents (subject, object and verb)? Ignoring the rarer morphological types and focusing on languages that are either exclusively concatenative or exclusively isolating, there is some bias but not a strong correlation. Overall, many more languages are exclusively concatenative than exclusively isolating: the former outnumber the latter by almost 8 to 1. This is true regardless of the word order one considers: there is more concatenative than isolating languages among those that are SOV, SVO, VSO, VOS or have no dominant word order (there is no data on object-initial languages). However, SVO languages are the most likely to be isolating: of the 15 languages that are isolating (and whose order order is known), 8 are SVO and only 3 are SOV. Another way to look at this: among SOV languages concatenative languages outnumber isolating ones by nearly 19 to 1, while among SVO languages this bias towards concatenative is much less strong, with only 3 concatenative languages per each isolating one. Still, I would say that it is not possible to claim a correlation between SOV and fusional/concatenative morphology. 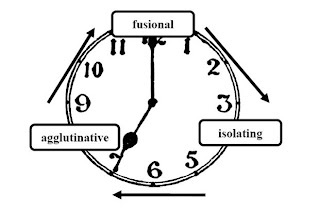 Numerous historical developments serve to illustrate the separate stages of this morphological type clock. For instance, while Proto-Indo-European is (typically) reconstructed to be a nearly purely fusional language (there are, however, some debates about the accuracy of this), its descendant languages have all moved -– albeit at different rates -– towards a more isolating profile. One example of a language that has made much progress in this direction is English, which in the course of its development from Old English to Modern English has lost most of the inflectional bound morphology. Another good example is French, which too lost most of its inflectional bound morphemes (both Modern English and Modern French can be characterized as three o’clock languages). Other, more conservative Indo-European languages, such as Russian and Lithuanian, have preserved more of their bound morphology, remaining closer to one or two o’clock. In contrast, Chinese illustrates the isolating-to-agglutinative change. More precisely, Early Chinese is now thought to have been a nearly purely isolating language but with (still) some elements of fusion (at about three o’clock), while Classical Chinese was even closer to the isolating ideal (roughly at four o’clock). But the clock of morphological type change keeps ticking, moving Modern Chinese in the direction of an agglutinative language, towards five o’clock. For example, Mandarin Chinese -– although still largely isolating -– has developed some bound morphemes, such as the perfective suffix -le and the durative suffix -zhe. Another example of the isolating-to-agglutinative change is the development of Dravidian languages (now spoken mostly in southern India). Proto-Dravidian was on the isolating side of agglutinative (at about seven o’clock), while its descendants, modern Dravidian languages, have moved along to a more agglutinative type at nine o’clock. Or consider the development of Australian aboriginal languages. Proto-Australian, the ancestral language of Australian aboriginal languages can be placed at about seven o’clock; modern languages from the Pama-Nyungan family have become more agglutinative, at eight or nine o’clock, while the non-Pama-Nyungan languages have moved even more radically, towards ten or eleven o’clock, having developed strong elements of fusional morphology. 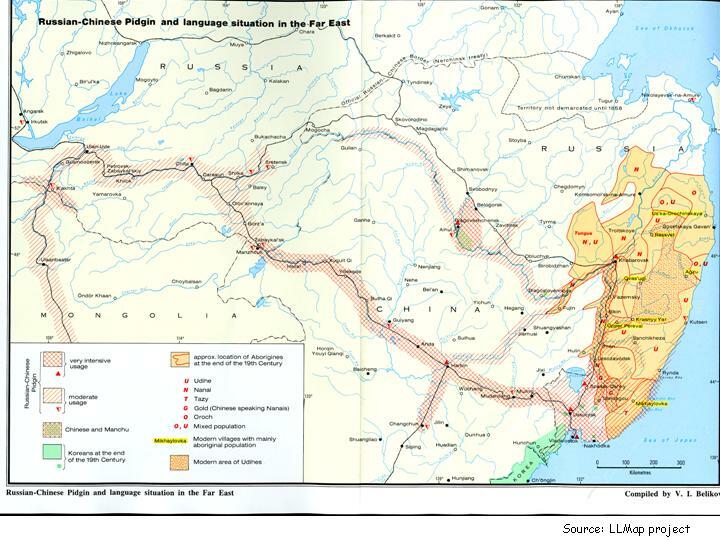 A similar degree of fusional morphology has been developed by many modern Finno-Ugric languages (also at ten or eleven o’clock), while their ancestral language, Proto-Finno-Ugric, probably was more purely agglutinative, at around nine o’clock. One may ask how long it takes to complete the cycle and if there are any known examples of languages that have gone successively through all the stages. The estimates for the length of the cycle are difficult to provide: according to Dixon (1994: 185), it can take “under normal conditions of change, probably anything from two or three thousand years to fifty thousand and more”. Given the length of the cycle and the fact that we have written records going back at the most five thousand years (and even that only for very few languages) and we can reliably reconstruct aspects of proto-languages going back about 6,000 to 8,000 years, it is unsurprising that there are no good examples of complete cycles based on a single language. The best example we have is of Egyptian, which has a long recorded history. According to Hodge (1970), Old Egyptian (about 3,000 BCE) had a complex verb structure which included reference to person; most of these affixes were lost by Late Egyptian (about 1,000 BCE), which used periphrastic constructions involving auxiliaries. By the time of Coptic (200 CE on) a new complex verb structure has developed, using quite different forms from those of Old Egyptian. Let’s now consider briefly what processes may change a language of one morphological type into another. The change from an isolating profile to an agglutinative one, as in the development of (Mandarin) Chinese, happens through the application of such processes as augmentation, which makes distinct words become grammaticalized as affixes. This is, for example, how the two aspectual suffixes of Mandarin Chinese developed. Another example of augmentation involves the fate of the Russian reflexive marker -sja: in Old Russian it was an independent word, whereas in Modern Russian it turned into a bound morpheme (linguists disagree on whether it is a clitic or an affix, but either way it is a bound morpheme). It is so thoroughly connected to the verb that some verbs cannot appear without it: for example, there are verbs bojat’sja ‘to be afraid’ and smejat’sja ‘to laugh’, but no sja-less (transitive/causative) versions, *bojat’ and *smejat’. Yet another example of augmentation involves creation of case markers from postpositions, verbs or nouns (for examples and a detailed discussion see Blake 2001: 161-175). The augmentation process happens because markers that start out as independent words appear frequently right next to certain kinds of words: for example, auxiliary verbs frequently appear right next to lexical verbs, and postpositions – next to nouns. This frequent juxtaposition leads to independent words being reanalyzed as bound affixes. The change from an agglutinative profile to a fusional one happens due to inevitable phonological changes, which preserve the same morphological elements but fuse their realizations: here a vowel is omitted, there two adjacent consonants are blended, and before you know it, the boundaries between morphemes are not as clear-cut anymore. A further application of phonological changes that leads to withering of grammatical morphemes, in combination with morphological simplification, where, for example, inflectional affixes may be dropped (especially, if they consist of sounds likely to be withered, such as unstressed vowels or a single consonant) will inevitably result in a fusional language moving in the direction of an isolating one. This is what happened to Proto-Germanic case inflection, which was expressed through special suffixes. 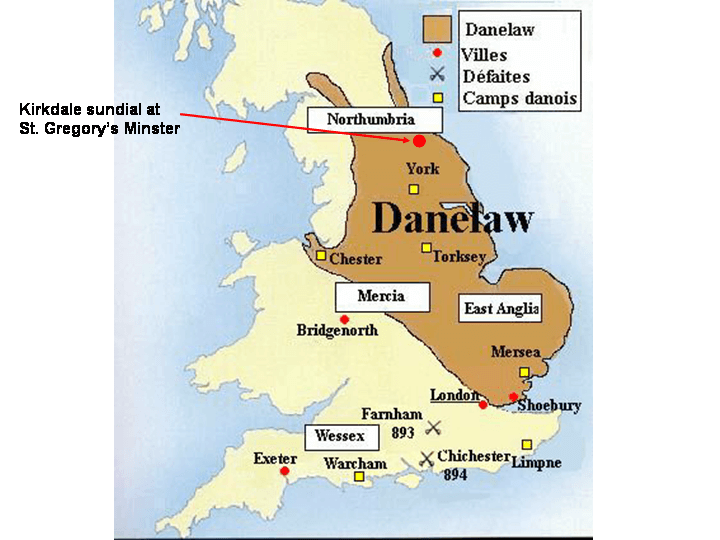 However, Proto-Germanic had word-initial stress (Modern English preserves this stress pattern in words of the Germanic origin), which made the case markers unstressed and as a result more predisposed to being lost with time. Blake, Barry J. (2001) Case. 2nd edition. Cambridge University Press. Dixon, R.M.W. (1994) Ergativity. Cambridge University Press. Today is the blog’s 1st anniversary!